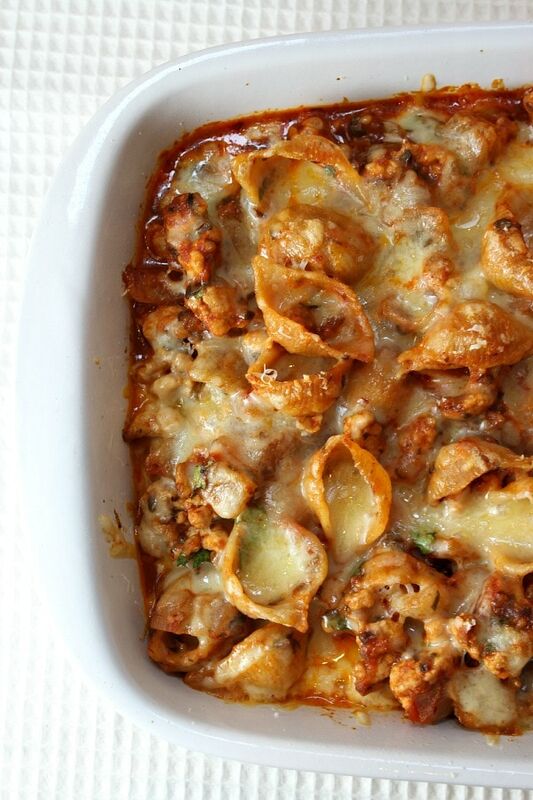 This Baked Pasta recipe utilizes whole wheat pasta, ground turkey and plenty of cheese. Watch the short video showing you how to make this recipe, then scroll to the bottom of this post and print out the recipe so you can make it at home. There’s an old saying in our house… “If there is nothing for dinner, then pasta is what’s for dinner.” Seriously, sometimes I get caught at 5 o’clock without any plans to feed my family a good dinner, and pasta is an acceptable fallback. I try to keep things like ground beef, turkey and sausage in the freezer, jars of marinara and different varieties of pasta in the pantry, some veggies in the crisper, and plenty of cheese in the much-loved cheese drawer. If I have these basics available, whipping up a quick pasta meal is not a problem. This simple recipe was created by checking out my refrigerator to see what was available so I didn’t have to get in my car and drive to the store! I spotted some ground turkey in the freezer (score! ), and I decided to try using shredded Monterey Jack since I didn’t have any mozzarella cheese. What’s the best kind of pasta? My friend Maria from the blog Two Peas and Their Pod recently shared a brand of whole wheat pasta with me that she loves: Delallo. I hadn’t tried it before (my boys usually say they don’t care much for whole wheat pasta) so I picked up their whole wheat shells at my local market and decided to give them a shot. Delallo carries a lot of varieties of pasta, but I chose the shells since it’s nice for the meat and melted cheese to be able to sneak inside the shell cavities while baking. What’s a good dish for baking pasta? 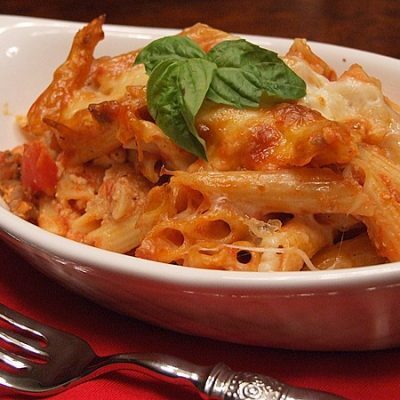 You don’t need anything fancy for making a baked pasta dish. If you have one of those 9×13-inch pans (a deeper one works best), then that should work just fine. Homegoods and Target carry good, inexpensive options for prettier casserole dishes. I’m always picking those kinds of things up when I see a good deal! 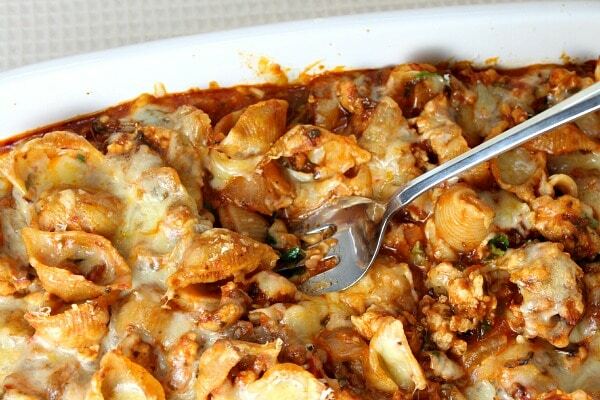 It turns out the whole wheat shells worked perfectly in this recipe- combined with sauteed onions, ground turkey, marinara and a very flavorful Monterey Jack cheese. I asked my boys if they liked the pasta, and they actually said that they LOVED the pasta. Then I broke the news that it was whole wheat. They enthusiastically agreed that I can make Delallo whole wheat pasta for them any time. I’m so happy I found this brand. Oh yeah, and this isn’t a sponsored post or anything, I’m just sharing a brand that you might like to try too. I recently found that Delallo makes a pretty decent gluten-free pasta too. 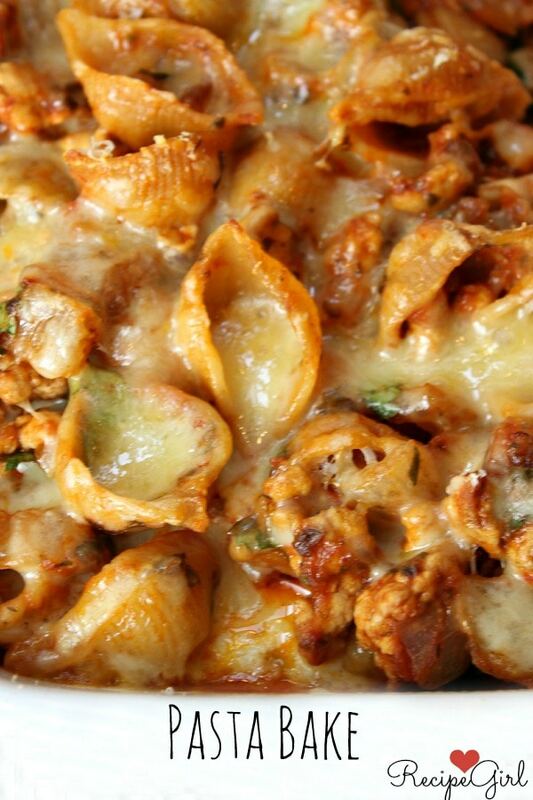 Here's an easy Baked Pasta recipe with ground turkey and plenty of cheese. Preheat the oven to 375 degrees F. Spray a 3-quart casserole dish with nonstick spray. In a large pan, heat the oil over medium-heat and add onion, garlic and red pepper flakes. Saute until onions have softened, about 4 minutes. Crumble in the ground turkey and cook until the turkey is browned, about 5 minutes. 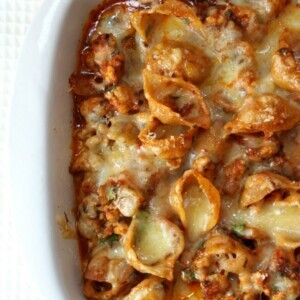 Stir in the pasta, marinara sauce, parsley and 1 cup of the cheese. Spoon the pasta mixture into the prepared dish. Sprinkle remaining 1/2 cup of cheese on top and the Parmesan cheese too. Bake until cheese is melted and bubbly, about 20 minutes. I'm not always such a fan of whole wheat pasta, but I really like the Delallo Foods brand- we used their whole wheat shells for this recipe. Delallo is in select stores, but you can always find it at Whole Foods Market. 4 cups of cooked pasta equates to about 2 cups dried. Thank you for this delicious recipe! The only thing I changed was reducing the “1/4 teaspoon red pepper flakes” to an 1/16 teaspoon (heaped). My 2- and 4-year old boys appeared to detect the spiciness at a couple of mouthfuls, but they still finished off their plates. Next time I won’t include the pepper flakes as it was still very tasty. Definitely a keeper! this looks good. I can’t tell you how easy it is to have a simple meal that fills everybody up and keeps us going until the next morning.. it’s also important to diabetics to have s omething like this to avoid a drop in blood sugar.. thank you.. nms. Anyway, my family enjoyed this very much and I can see it being quite a versatile recipe as well! My family will love this. Thank you for sharing. I tried this recipe the other night and it was scrumptious. It was easy to make and all the ingredients were readily available being that I make turkey meatballs and spaghetti all the time. Definitely a regular on the menu. Thank you! This turned out great – thanks! I used 1/2 lb. ground beef instead of the turkey because that is what I had in the freezer. This is great for cleaning out the freezer & pantry! I made this with regular pasta and turkey. I didn’t tell my husband and son until after they’d taken a few bites and said they really liked it that it had turkey in it. They aren’t big fans of ground turkey usually but in this dish it’s really good. 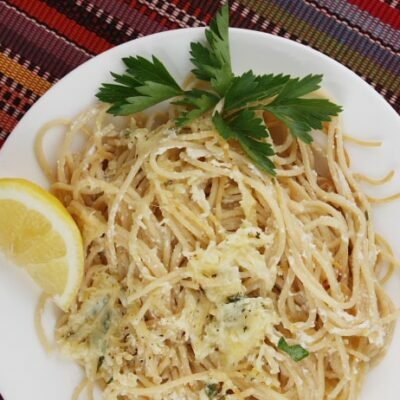 I used an Italian Cheese Blend for the cheese that comes already shredded in a package. I’m sure this dish would be really good with ground beef or sausage as well. 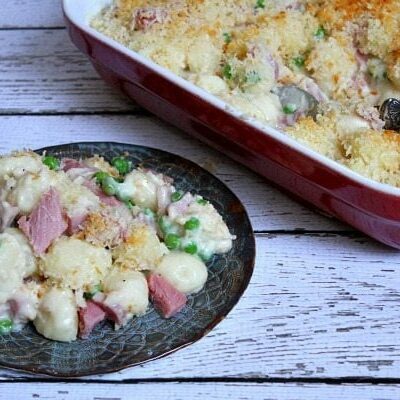 Easy to prepare and very tasty! This looks excellent! My only question is that you seem to have left out the step for when to add the parsley (unless I’m totally blind). I’m assuming you’d add it at the same time as the pasta and marinara sauce, correct? I’ll definitely be making this soon! Thank you for spotting that- I added it in the directions. Appreciate the heads-up! What is the nutritional info? Weight watchers points? Not sure- but you can put the ingreds into a recipe calculator to figure it out- I like to use Spark People Recipe Calculator. 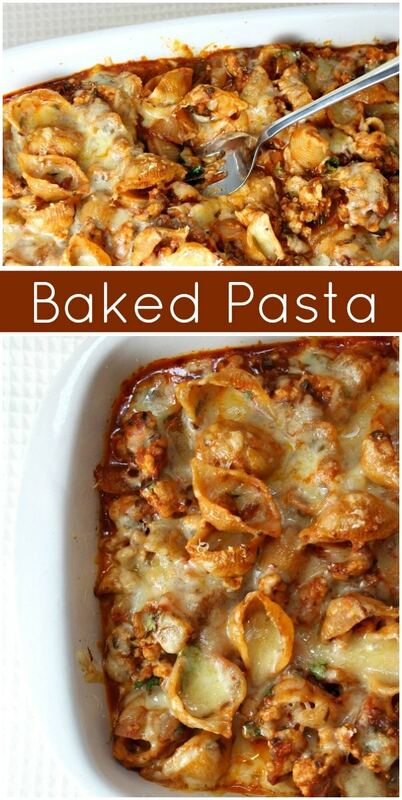 I loved baked pasta dishes 🙂 this looks delicious!! Made this bake last night, very easy and really really good! Good one for an informal dinner party too. To keep!! I bought some Delallo whole wheat pasta as a result of your comments and cooked it today. It is delicious. It’s the brand I will use from now on. I actually like it better than “regular” pasta. I made this for dinner tonight using organic ground beef. My husband had two servings – and he rarely takes seconds. I can’t even move right now. This looks like total comfort food! And I need it in my life asap. 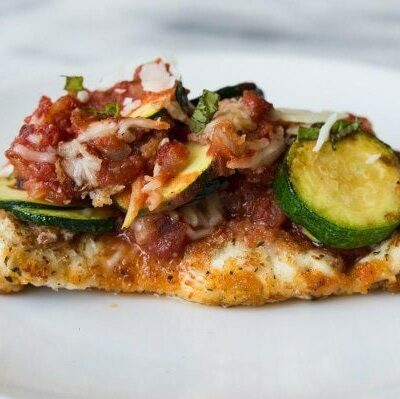 This is such a great weeknight meal! I always need great last minute ideas.